Wow! Another amazing picture! I did not realize that spiders could actually go limp. Do you think the waspy bug ate the spider? Are they insectivores? This is really interesting. I think maybe those are called Circus Bugs and this is part of their act. Re: How do you do it?! what is this ballet called? 6>8. It's one of those po-Mo things. 6>8 legs... yer re-furring to # legs right? Yup. But I'm trying to be all cool and elliptical and evasive and use numbers for things that could be described perfectly well with normal words, but I want everyone to know how multi-modal I am meaning that not only can I use words, I also can use numbers. You're supposed to think I am very cool and smart, and you're also supposed to interpret my social awkwardness as a form of genius that is so advanced that you couldn't even understand it unless you went beck to college. And not some liberal arts dump either. I'm talking engineering school. Cdozo did that and now she understands me. I"m pretty sure it was worth the money and all the stress. Kind of sure ... I mean I hope it was ... I'm going to catch a spider and lay my eggs on it. Actually that's the winners' larvae's dinner. Spider-killing wasps usually bury (or otherwise inter) the spider and lay their eggs on or in it; the larvae then have food to sustain them until they morph into adults. Other solitary wasps do the same with caterpillars, crickets, etc. Many specialize in one kind of prey. I've seen a couple of these wasps harassing spiders out in the field, but I never saw what they were trying to do. But on Friday I was out on the land talking to someone when I saw the wasp above with her bounty out of the corner of my eye. As usual, I had my camera ready. So I ran over and got the shot. 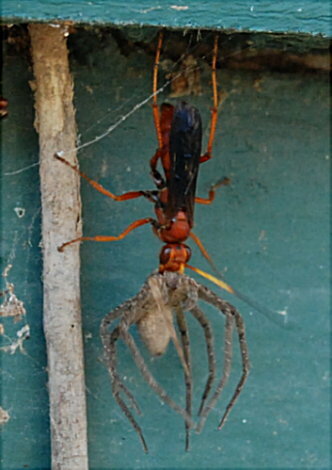 Some time when I see a wasp dive-bombing a spider I want to settle in and see if I can photograph the whole drama. It would be pretty impressive to watch. This info makes the picture even more interesting. I wonder how many young a spider carcass supports. I guess the eggs hatch out fairly soon or else the food would dry up or decay.